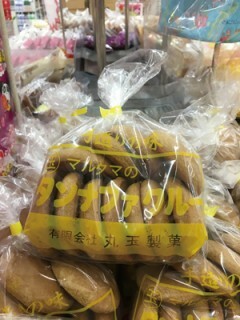 “Tannafakuru” is an Okinawan sweet hand made of a mix of brown sugar, flour, and eggs. It’s made locally at the sweets stores and confectionaries, and sold at almost every local supermarket and grocery shop, although not in convenience stores. It’s usually packed in yellow bags. It’s name is a combination of “tannafa,” a reference to Tamanaha, the name of the person who created it, and “kuru” that is “black” in Okinawan dialect. There are two versions regarding the latter. One is that Tamanaha was a very dark-skinned person. The other version refers to the color of the sweet that is black when baked. But which ever is true, everyone loves to eat it. As Tannafukuru is sometimes sticky it could easily lodge in the throat, so most people eat it with milk or tea. A more expensive variety of the sweet is “kunpen” that looks the same but has a sesame/peanuts paste filling.